Cycling, as one of the most popular forms of exercise, is a broad aspect. It is one of those exercises that can help a lot of people including toddlers, the able-bodied, pensioners or those with disabilities when it comes to conveniently incorporating exercises in their daily routines because it is also one of the most enjoyable and affordable means for transportation. The good thing about cycling is that it is only a low-impact form of exercise so you need not worry about stressing your muscles, joints and any other part of your body when doing it. Despite its low impact, it still allows you to stay in shape. 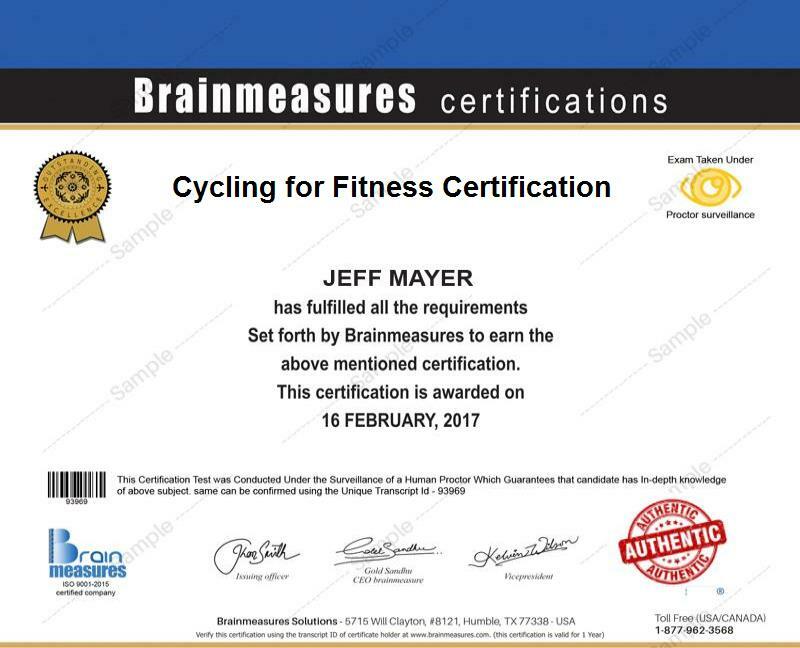 If you are interested about understanding everything about cycling to achieve the highest level of fitness, then the cycling for fitness certification course which is now offered by Brainmeasures is highly recommended for you. The cycling for fitness course offered by Brainmeasures gives you an easier time understanding everything about cycling, its benefits for those who want to take advantage of it in order to achieve their desired level of fitness and the many things that you can do to successfully carry out the cycling exercise on a regular basis. The cycling for fitness training that you can get from Brainmeasures is highly comprehensive enough that you will get the chance to become a certified personal trainer or fitness trainer who focuses on cycling after completing the certification course. Because Brainmeasures is already an ISO certified online certification company, you have a hundred percent assurance that all the information that you generate from the course can help you in your quest to achieve optimum health and fitness. Receiving your certificate in this field is like receiving one of the best fitness certification and you can use it to start physically training others through cycling. The cycling for fitness certification program which you can now easily access at Brainmeasures aims to help all individuals who want to start getting the benefits of regular cycling workouts especially when it comes to improving their health and physique. It is also suitable for both existing and aspiring cyclists regardless of their age and fitness levels who wish to learn more about how to safely train their bodies without pain through proper cycling and for anyone who wishes to become a fitness or personal trainer who is more focused on providing cycling training to the participants of his fitness programs. Cycling for fitness certification holders can also expect to enjoy a more stable flow of income after starting to work in the fitness industry. If you are a cycling certification holder and you are still a beginner in the industry, then your annual salary can be expected to be within the range of $49,000 to $60,000. This can grow to as much as $97,000 to $117,000 after your skills and expertise are more recognized in the field. You may also open up your own cycling for fitness club to further boost the level of your income.